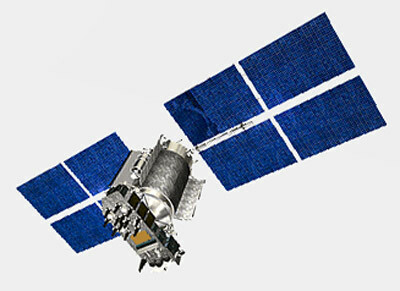 Uragan-M spacecraft are the second generation of GLONASS satellites with an increased lifetime of 7 years following up the first generation Uragan spacecraft. GLONASS (Globalnaya Navigationnaya Sputnikovaya Sistema, Global Orbiting Navigation Satellite System) is a Russian space-based navigation system comparable to the American GPS system, which consists of Uragan spacecraft. The operational system contains 21 satellites in 3 orbital planes, with 3 on-orbit spares. GLONASS provides 100 meters accuracy with its C/A (deliberately degraded) signals and 10-20 meter accuracy with its P (military) signals. The Uragan-M spacecraft are 3-axis stabilized, nadir pointing with dual solar arrays. The payload consists of L-Band navigation signals in 25 channels separated by 0.5625 MHz intervals in 2 frequency bands: 1602.5625 - 1615.5 MHz and 1240 - 1260 MHz. EIRP 25 to 27 dBW. Right hand circular polarized. On-board cesium clocks provide time accuracy to 1000 nanoseconds. A civil reference signal on L2 frequency is to be added after the completion of flight testing of Glonass-M in 2004 to substantially increase the accuracy of navigation relaying on civil signals. The spacecraft can be launched in triplets using Proton-K Blok-DM-2, Proton-K Briz-M, Proton-M Blok-DM-2 or Proton-M Blok-DM-03 boosters. Single launches on Soyuz-2-1b Fregat-M boosters are also planned. At least one single launch using an indian GSLV Mk.2C was also planned, but never conducted. The Urgan-M satellites will be replaced by the smaller Uragan-K1 and Uragan-K2 satellites.